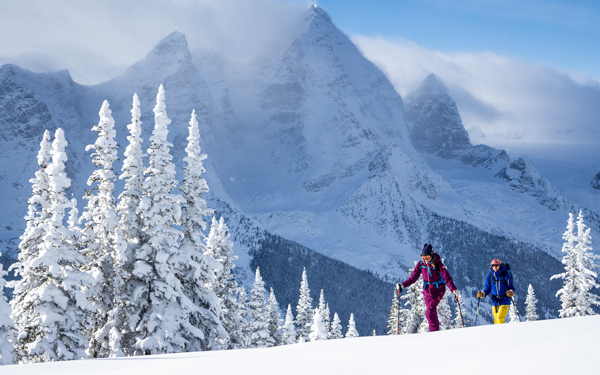 The Purcell Mountains of British Columbia are renowned for their ability to produce high quality snow and provide excellent terrain for skiing & splitboarding. 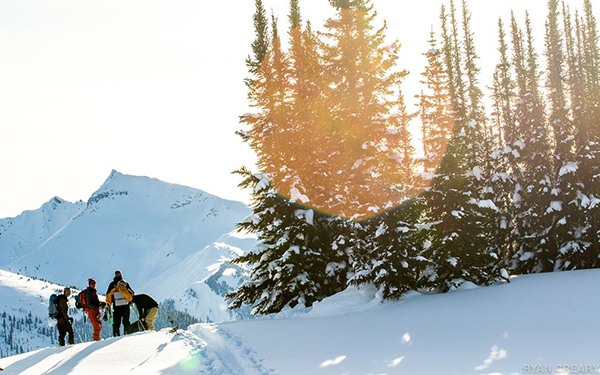 Our introductory backcountry ski training and splitboarding program at the comfortable Purcell Lodge is the perfect way to experience all that backcountry skiing has to offer. 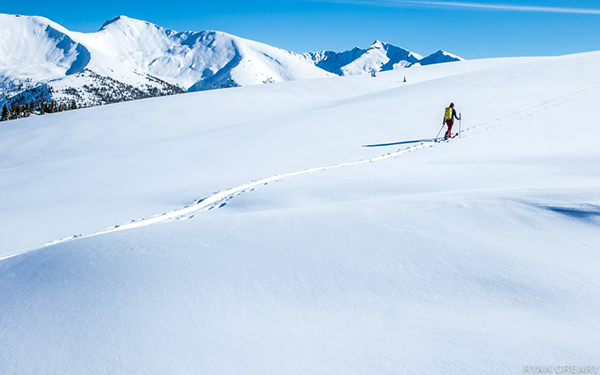 With a helicopter flight into the heart of the mountains you will feel the remoteness of the area while learning the skills to backcountry ski and splitboard. Days will be spent skiing the treeline and alpine terrain with instruction on the way. There will also be a focus on avalanche awareness and companion rescue skills. Purcell Lodge is a comfortable base for our program. This full-service lodge has comfortable amenities including a sauna and an onsite chef who will provide all meals on the program. We meet in Golden, BC at 8:00 am at the Alpine Helicopters hanger (204 Fisher Road, Golden, B.C. V0A 1H0) where we will complete waivers and a safety briefing for the flight. Our short flight into Purcell Lodge is sure to be one of the many highlights on the trip. Once settled in the Lodge we will complete an avalanche companion rescue instruction and practice session before completing our first ski tour in the area. We will be covering the essentials of backcountry ski equipment, efficient travel techniques and layering for comfort on a tour. Expect great views and some great turns! In the evening we will have a short avalanche awareness presentation. After an amazing breakfast we will travel further from the lodge and look for longer powder descents that only backcountry skiing in the range can provide. These are the days that backcountry skiing is all about. We will also be consolidating your backcountry equipment use and look at building your track setting, corner building and powder skiing skills. You will welcome the lodges sauna and well-prepared meals at the end of these days! With a morning flight from the lodge we will arrive back in Golden addicted to backcountry skiing and planning our next trip into the backcountry. After introductions and a equipment check, we will be briefed on helicopter safety and have a scenic 15 minute flight from Golden to Purcell Mountain Lodge. Once settled in the Lodge we will complete an avalanche companion rescue instruction and practice session before completing our first ski tour in the area. We will be covering the essentials of backcountry ski equipment, efficient travel techniques and layering for comfort on a tour. The next two days will be spent in the backcountry areas around the lodge. 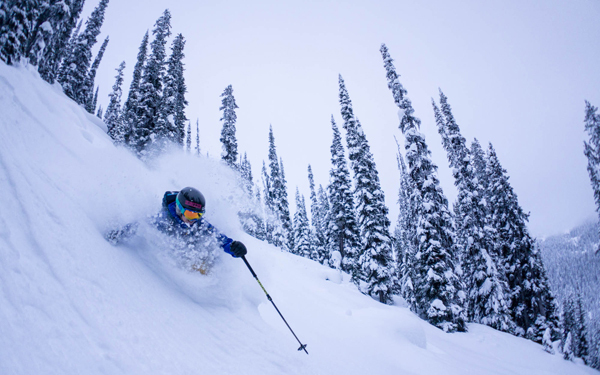 Our instructors are certified professional ski guides who are licensed to teach and guide in the backcountry. The Purcell Mountain Lodge Intro to Backcountry Skiing has a maximum of 8 participants per instructor with a minimum of 5. Participants are responsible for their own transport to Golden, BC. Golden is a 2 hour (165km) drive west from Canmore. 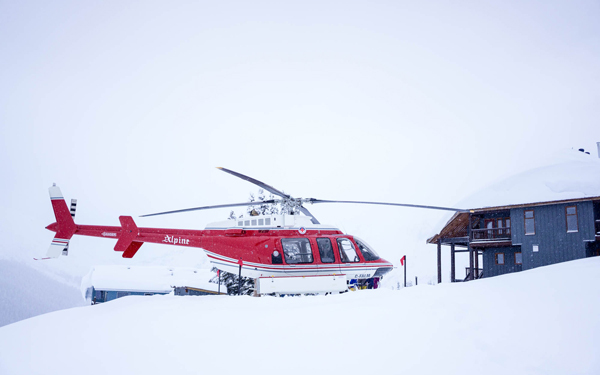 Helicopter transport to and from Purcell Mountain Lodge is included. If you are flying from afar for the program, we suggest that you rent a car for your visit. 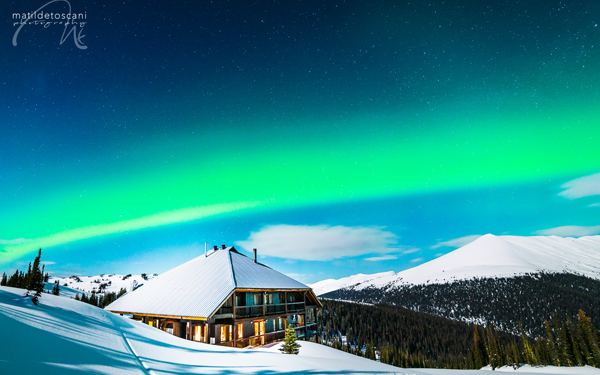 Purcell Mountain Lodge has been in operation for 28 years and is located in the Northern Purcell Mountains at 2200 meters. 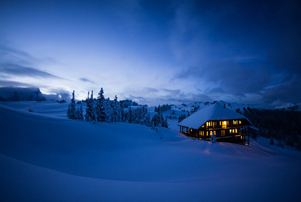 The luxury backcountry lodge is situated at treeline with stunning views into the Selkirk Mountains to the West and North. They take pride in offering guests a truly unique and unforgettable mountain experience. 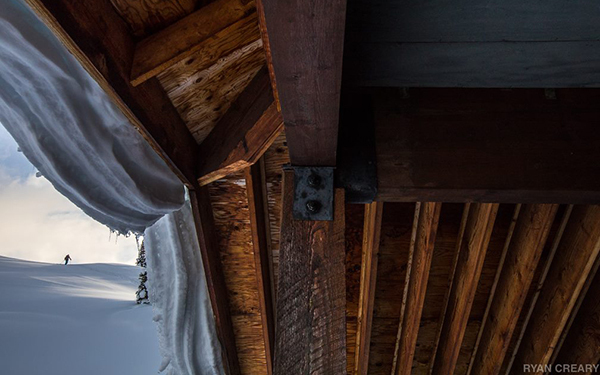 After a day of adventure, guests can relax and unwind in their three-story, timber-framed lodge. Rooms are located on the upper floor and all come with mountain views that are guaranteed to inspire and refresh. Each room has its own sink and vanity and across the hallway you will find three private hot showers and three private bathrooms. 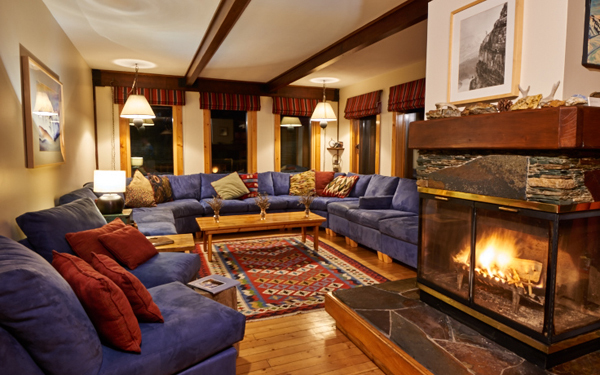 Luxury in the backcountry is complete with an open dining area, cozy living room, cedar wood-burning sauna, quiet library, entertaining traditional board games and puzzles and wood burning fireplace. 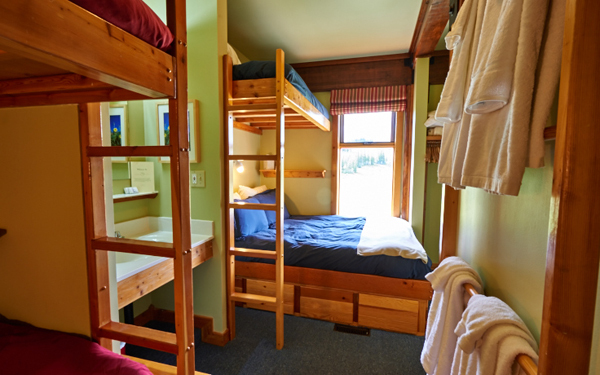 Three nights’ accommodations at Purcell Mountain Lodge is included. Choose from single or double occupancy. There is an additional charge for single occupancy. 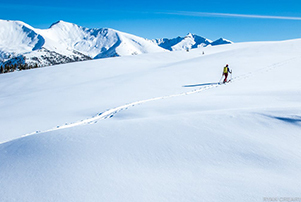 We recommend that you book your own pre and post-trip accommodations in Golden, BC if needed. All meals are included from buffet lunch on day 1 to departure breakfast on day 4. Purcell Mountain Lodge’s gourmet chef will prepare fresh, wholesome mountain-inspired meals. The Lodge can cater to each guest by accommodating any special dietary restrictions or allergy concerns. Delicious appetizers are served each day after skiing with a cold beer, or a glass of signature BC wine from their bar selection. Alcoholic beverages are an additional cost. Due to helicopter capacity guests are permitted 25lbs of personal luggage, plus a day pack with extra ski clothing and their ski equipment. Luggage should be packed in a small to medium sized duffel bag (traditional suit cases are not appropriate). 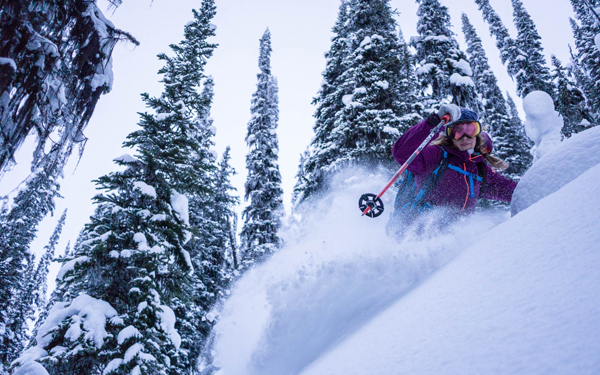 System 1 – Alpine Touring skis are essentially downhill skis with a special touring binding which allows the heel to lift whilst going uphill or across the flats and then locks down to become like a regular downhill binding. We recommend this system to anyone with a background of downhill skiing. System 2 – Telemark skis. These should only be used for this program if you are at least an advanced-intermediate telemark skier with some backcountry experience. Splitboards – If boarding you need to be an advanced boarder and you must use a ‘splitboard’. A snowboard and snow shoe combination is not acceptable. Please don’t bring a board if you’ve never boarded in the backcountry before. Poles are essential for boarders. Skis/Splitboards: if skis, either Alpine Touring or Telemark. We recommend a short (160 – 185cm) wide ski designed for powder. Snowboards must be splitboards. Please see note under rental information if you are renting ski equipment. Avalanche transceiver – a triple antennae digital transceiver. If you have an older style, single or double antennae, we will loan you a transceiver for the program. Avalanche probe (loaners available on request). On the field days, there can be prolonged periods of inactivity in very cold temperatures. We recommend bringing extra layers. Light clothing of varying thicknesses that can be ‘layered’ to achieve comfort and versatility. The most important consideration for clothing is the ability to regulate temperature as you change from periods of activity to periods of rest. Cotton clothing is not appropriate as it causes rapid heat loss when wet. Long Underwear (top and bottom). They should be synthetic such as Capilene or Merino Wool. Patagonia Capilene and Merino base layers are good options. Waterproof jacket with hood and pants (Gore-Tex or nylon) A hardshell set up is essential when the weather turns really wet. Gore-Tex, H2NO or similar material works great. The Patagonia Torrent shell is a good example of a waterproof hardshell jacket. Casual clothing for inside the lodge. Keep this to a minimum. Towels and linens are provided by Purcell Lodge. Please book as early as practical to avoid disappointment. We require 35% despoit at time of booking with the balance due 8 weeks before the program start date. 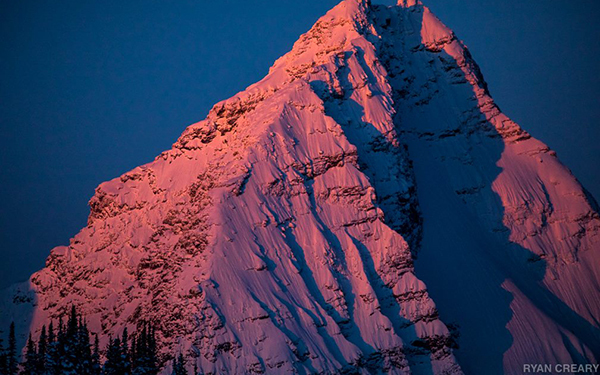 $1750 CDN includes return flight from Golden, BC to Purcell Mountain Lodge, double occupancy accommodation at Purcell Lodge, food from Lunch on day 1 to breakfast on day 4, instruction, materials and use of avalanche safety and snow study equipment. GST is extra. Additional $250 CND for a single room supplement based on availability. Not included: Transport to and from Golden, BC, food or accommodation before and after the course, alcoholic beverages (can be purchased at Purcell Lodge), gratuities. This program is perfect for guests who would like to experience backcountry skiing or splitboarding in a remote but comfortable setting. No previous experience is required however moderate hiking fitness and the ability to ski blue runs in any condition is required.